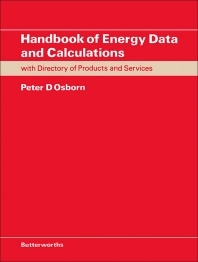 Handbook of Energy Data and Calculations: Including Directory of Products and Services provides a comprehensive review of practical energy problems. This manual is organized into four sections. Section A contains data charts and tables relevant to the field of practical energy. Section B covers theoretical background, product technology, case histories, and calculation procedures. Section C is composed of directory of products and services. Bibliography and sources comprise Section D. This contribution to energy education will be very helpful to 'energy executive' engaged in this field.